Fun and fellowship with friends and acquaintances can add so much joy to our everyday lives. This may be especially true for those with Parkinson’s disease and their care partners. When a person realizes that their life has changed, it is natural to seek out others in the same circumstances for encouragement and enlightenment. These relationships can become vital to one’s emotional health and well-being. Facilitating these relationships and interpersonal activities is a special aspect of the Hope Parkinson Program. Help is available through our support groups, social and creative activities, and exercise classes - even laughter yoga! For those with Parkinson’s disease, the emotional support we offer is as important as our support through physical activities. It’s important to use the month of April to reach out to friends, family members, co-workers, and people in your community to connect them with the Hope Parkinson Program. 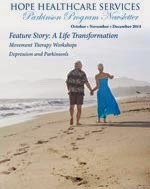 Visit www.HopeParkinson.org/Join, or call Michelle Martin at 985-7727 to register by phone.